I am enjoying Dynamite’s various team ups, which serve as a great way to get to know other characters in the company’s roster that I haven’t quite focused on before. 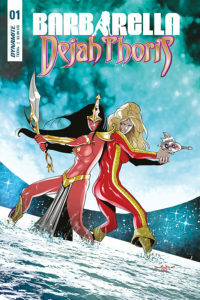 In Barbarella/Dejah Thoris #1, my favourite Barsoomian princess is teaming up with space heroine Barbarella on a mission whose mystery has yet to reveal itself. When Barbarella answers the summons of a scientist and finds them murdered, she must follow the clues left behind to solve the mystery of the scientist’s death and understand exactly what it was the scientist was working on. Meanwhile, Dejah is in the field working with Barsoomian scientists and surveyors to unlock the secrets of Mars, only to find a strange mirror instead that pulls her through to another world. 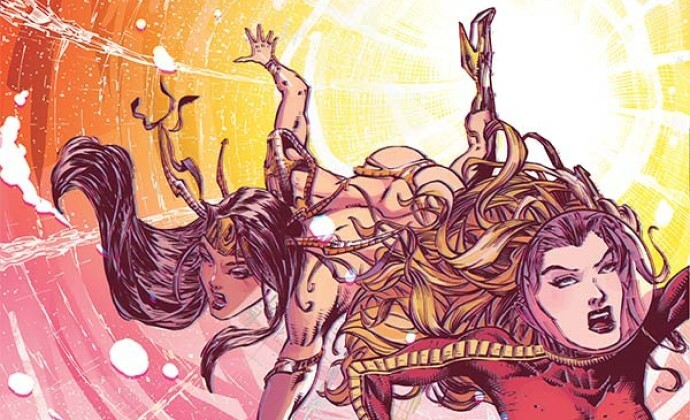 As with Dejah Thoris’ first encounter with Vampirella, there is a moment of aggression between the two, but this thankfully is merely due to the nature of their coming together. Being sucked into a strange portal and winding up in a dark and dangerous place tends to leave one a bit disoriented. 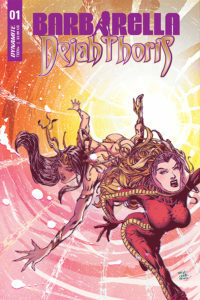 But Dejah and Barbarella quickly determine that fighting with each other won’t help them escape whatever mess they have ended up in. As always, Dynamite offers several covers for each of their titles, and this book is no exception. Cover “A” by Zach Hsieh features a spidery sense of vertigo that almost distracts from the curves. There are several other covers, but my stand out favourites are covers “B” and “C” by Jorge Fornes and Pasquale Qualano, respectively. Within the pages, García’s art shines, with Duke’s colours bringing bright contrast to the bleak situations the women find themselves in. Shifting from a clinical and cold laboratory to lush jungles, to expansive desserts, to the depths of the ocean, García includes just enough detail in the landscapes while still allowing the characters to shine. The art also works well in defining the personalities of the women. Dejah Thoris is clearly the regal princess she is meant to be, without coming across as aloof. Meanwhile, Barbarella steps with relaxed confidence and a bit of coquettishness into every situation. The art is as casual and coy as Williams’ dialogue as the story moves smoothly and flirtatiously along, easing the reader into the mystery as Barbarella flexes her detective skills to piece things together. And all the praise goes to García for not putting the princess of a dessert planet in heels! Once again, Dynamite hits the mark with its team ups. 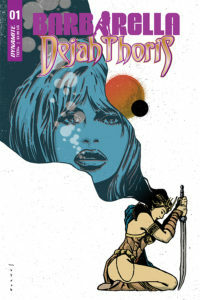 If you’re looking for another opportunity to get to know one or more of their major players, Barbarella/Dejah Thoris #1 is a great place to start. The story and characters are welcoming, and the mystery is enticing, leaving me eager to find out how this partnership will handle whatever the constructs of time have to throw at them next.